Stunningly simple strapless gown with chiffon diagonal overlay accentuating patterned panel. 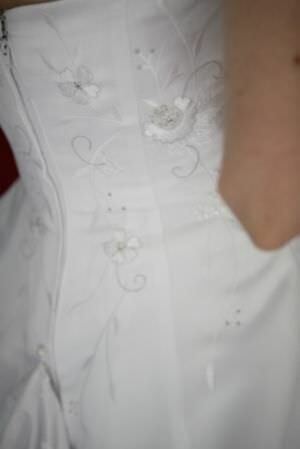 Matching flowers and beading on bodice, panel and back to bottom of train. Subtle but beautiful. Long train bussles neatly while retaining pattern. Long length and can include hoop.